I read a lot. A lot. To the point where it can cause arguments between my husband and I. I try to tell him about some exciting thing from my latest novel, and he’s upset because he thought I was actually needing him for something exciting. Sometimes we even joke about it, to the point where if I can’t read about it? It doesn’t exist. At least not for me in my world. Sadly, sometimes it’s a very true statement. In some ways, my husband knows me too well, and he generally reads me right. One thing I couldn’t read about? 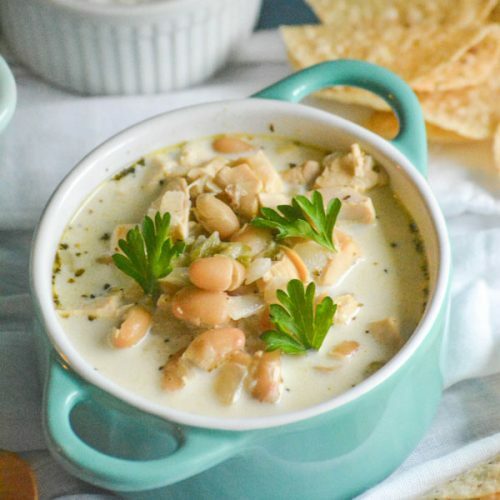 The perfect recipe for Creamy White Chicken Chili. I mean sure, there are plenty of variations out there, but no matter which ones I tried- it just wasn’t what we were hoping for. There’s nothing worse than craving something, and finding your exhausting search to be a constant let down once you’re seated at the table and ready to dig in. 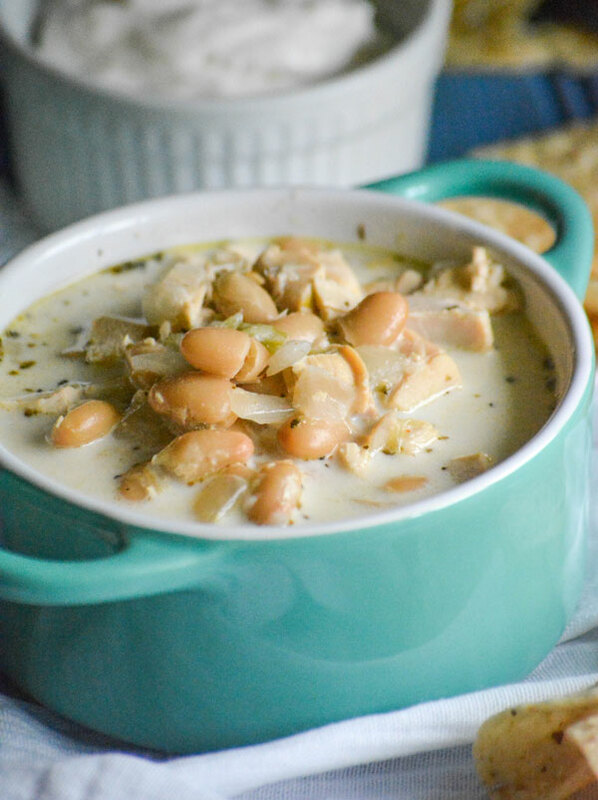 Luckily, multiple experiments with our own batch of Creamy White Chicken Chili finally paid off. You won’t find a creamier, heartier, tastier version. One thing my husband knows, is he never has to second guess when I want to share something exciting with him from our kitchen. We always see eye to eye on that front! 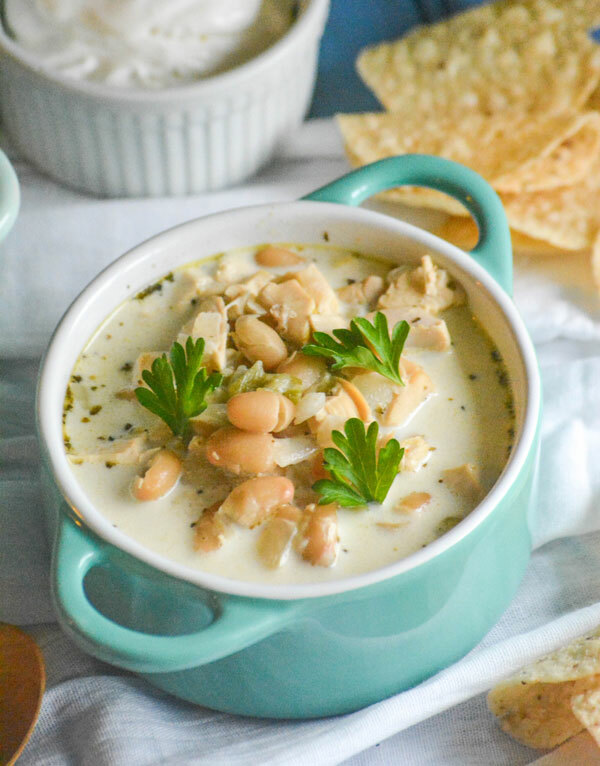 The look we shared over a bowl of this Creamy White Chicken Chili let me know we’d finally found the one when it came to white chili. 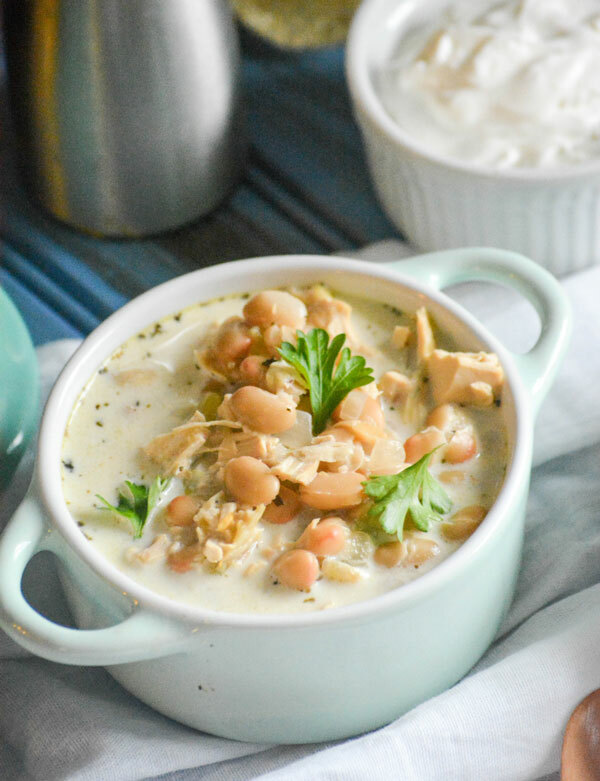 An easy recipe for a flavorful white chicken chili, studded with chunks of meat, beans, and a zesty blend of savory spices. In a large dutch oven, over medium heat, melt the butter. Stir in the onion and saute until it becomes translucent. Stir in the garlic, and saute just until fragrant-about a minute. Stir in the chicken, beans, chilies, corn (if using), and seasonings. Bring the mixture to a rolling boil. Reduce to a simmer, and let cook for 30 minutes. Add the cream cheese, stirring until completely melted. 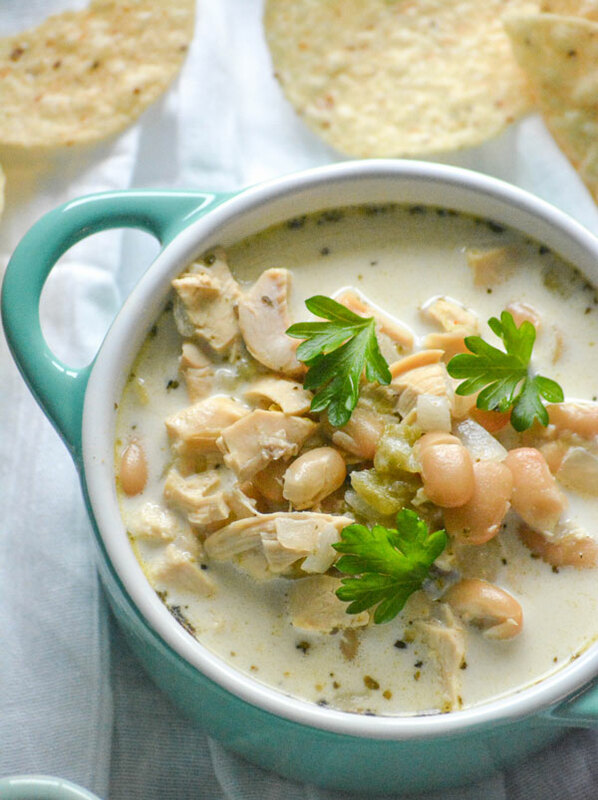 Remove the dutch oven from heat. Stir in the sour cream and cream until evenly incorporated. 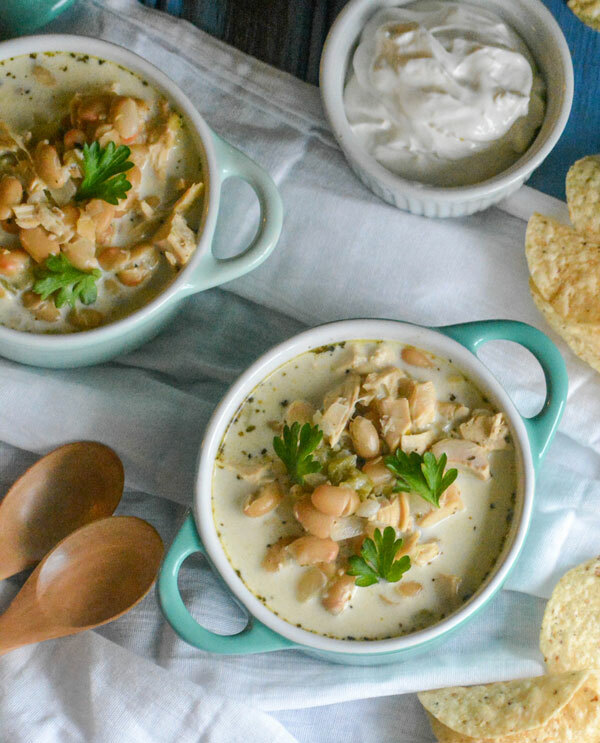 Ladle into bowls, top with your favorite toppings, and enjoy! I make a chili like this but no corn and I don’t use so much fat (maybe if I did the family would like it more). 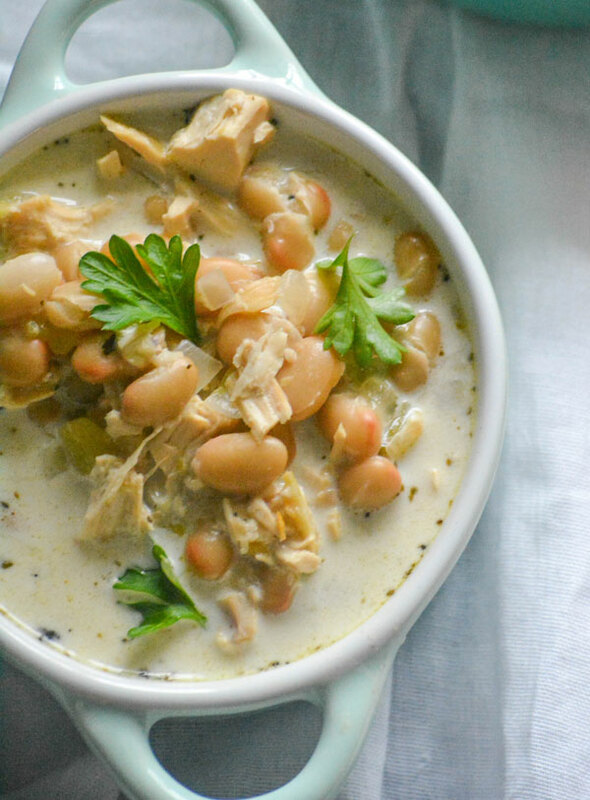 Great recipe to have during the winter. Thanks for sharing your chili recipe with the Fiesta Friday party.